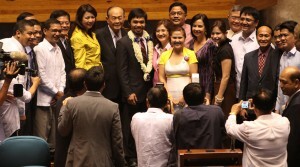 COLLEAGUES of Sarangani Rep. Manny “Pacman” Pacquiao at the House of Representatives congratulated him for dominating American challenger Chris Algieri to retain his World Boxing Organization (WBO) welterweight title during the “Hungry for Glory” boxing extravaganza at the Cotai Arena inside The Venetian Macao Sunday afternoon. House independent bloc leader and Leyte Rep. Martin Romualdez said Pacquiao’s victory is another indisputable proof that he is a world-class athlete. “Pacquiao proved that with solid determination and hard work, the Filipino can triumph over anybody or anything anytime. We extend our unfathomable congratulations to Congressman Pacquiao,” said Romualdez. Malacañang hailed the convincing and world class triumph of Pacquiao over New Yorker Chris Algieri. “Strength, grit, and courage were written all over his face and demeanor throughout the fight. With every punch that scored, millions of Filipinos cheered him to victory from all corners of the country and the world,” Presidential Communications Secretary Sonny Coloma Jr. said in his note issued to Palace reporters yesterday. The People’s Champ once again showed the world why he ranks among the “best” boxers in history. Sen. Nancy Binay stressed this point following the victory of Pacquiao over Algieri in Macau yesterday. “Chris Algieri tried to wrest the World Boxing Organization (WBO) welterweight crown away but our country’s fighting pride rose to the occasion to successfully keep one of his many titles,” said Binay. “Manny, saludo kami sa panibago mong tagumpay! Manny, isa kang inspirasyon sa ating mga kababayan. Patunay ka na kahit anumang pagsubok ang harapin, ito’y mapagtatagumpayan sa tulong ng pagtitiyaga; dedikasyon; at pananalig at pagtitiwala sa sariling kakayahan at sa Maykapal. Mabuhay ka Pambansang Kamao! Mabuhay ang Filipino!” Binay said.